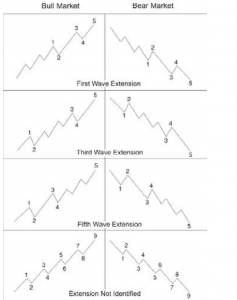 Now as we know something about the Elliot wave principle. So we can carry forward our discussion to the types of motive waves. Motive waves sub-divide into 5-waves and always moves in the direction of one larger degree of trend. The goal of motive waves is progress in prices and the rules i.e. 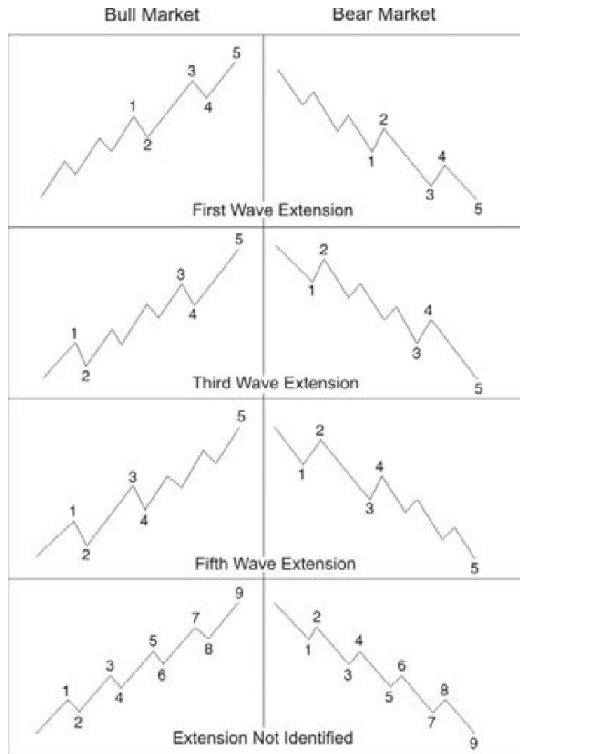 Wave 2 always retraces less than 100% of Wave 1, Wave 3 always travels beyond the ending of Wave 1 and most of the times is the longest than Wave 1 and 5 and is never the shortest one & Wave 4 never enters the price territory of Wave 1. These rules will always make sure that prices progress and have arithmetic relationship between them. Motive waves are of two types – impulse and diagonals. The most common type of motive waves is impulse. As we know, in a complete cycle of 8-wave structure 1-2-3-4-5-A-B-C, Wave 1, 3, 5, A and C are impulses which sub-divides into 5-waves. Moreover, these impulses follow the rules which we mentioned in the earlier paragraph. These rules should never be ignored if we have to call a particular wave being impulsive in nature. Impulse waves always contain an extension or truncation as mentioned by Elliot. Extension can occur in any impulse wave 1, 3 or 5. It is noticed Wave 1 doesn’t extends much of the times in real life. But it is not that Wave 1 never extends, it happens sometimes. Wave 3 mostly extends in the stock markets and Wave 5 is seen extending in commodities. These are not rules but we are getting ourselves familiar with the kind of markets someone follows. There may be instances where we may not be able to find which wave is extended. Elliot used the word “failure” when a 5th wave doesn’t move beyond the high of 3rd wave. We hereby call this situation as “truncation”. Truncations can be identified with the sub-division of 5th wave in to 5-wave. These generally occur after very strong or extended 3rd waves. Diagonals are motive wave patterns which sub-divide into 5-wave structure but the sub-divisions are 3-3-3-3-3 and don’t have characteristics of impulse and violates the rules which impulses follow. Wave 4 always enters the price territory of Wave 1 and these can also end in truncations. Diagonals are of two types – ending and leading diagonals. The difference is nothing but the position at which these occur differentiates them. 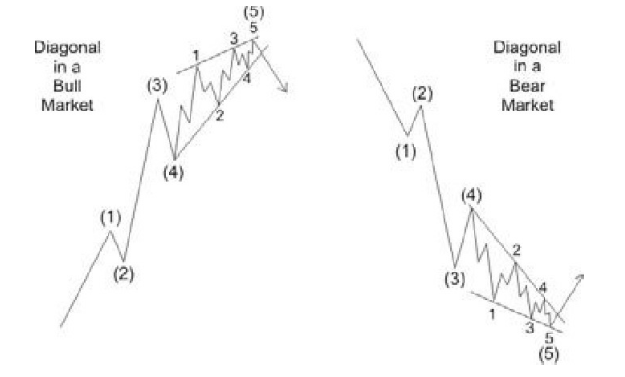 Ending diagonals occur at the last stage of a trend and are seen mainly in Wave 5 or C which ends a trend or move. Leading diagonals are seen in Wave 1 & A position but are very rarely seen. We still have to know this pattern as it may occur sometime in our life. Diagonals can take the formation of contraction or expansion. Contracting diagonals are often known to many analysts as wedges. 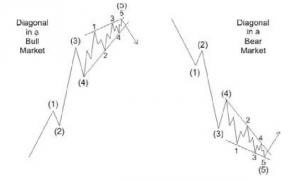 Elliot wave is a very descriptive concept and is a powerful tool in the arsenal of any analyst. We will cover this concept in our further articles.